A mixture of sensuous luxury and aesthetic simplicity, the historic Moroccan city of Marrakesh attracts a fashionable crowd these days, especially during the winter months.The dusky, pink-walled Medina, the 'old city', boasts a greater density of chic boutique lodgings than possibly anywhere else in the world and the multitude of emporia will keep shopaholics busy for days. Even non-shoppers will be amazed by the colour, diversity and vibrancy surrounding the souks. In short, fabulous nightclubs, new-wave riads, the radical new Moroccan food and the wealth of outdoor, participation excursions makes this the coolest place to be. Les Jardins is located in the heart of the Marrakesh Medina (old city), within a short walking distance from the Djemaa El Fna Square . Les Jardins de La Koutoubia is a former Riad (traditional Moroccan Palace built in a grand style) dating back to the 13 th century and converted into a magnificent and luxurious accommodation property. This offers a unique experience! You'll be right in the centre of the action in Marrakesh, with the exotic thrill of the sights and sounds of the labyrinthine Souks outside the door. With arrival after a 15-minute drive from the airport, you will enjoy the feeling of calm and relaxation in this splendid property, sheltered from the bustle and noise of the city. This delightful property, a veritable palace built in the classic stylish Moroccan style, has been lovingly restored with an amazing ambiance. It is a haven of peace, with attentive service and great atmosphere. Classic Moroccan motifs define the different areas. All rooms have satellite TV, direct dial telephone, mini-bar, hair-dryer, individual safe, heating/air-conditioning and bathroom. The accommodation includes breakfast and guest rooms are upgraded to mini-suites. Les Jardins de La Koutoubia has two restaurants on the ground floor as well as another one on the roof terrace, offering a fantastic panorama on the city. The hotel has a beautiful swimming pool (heated in the winter) amidst the courtyard luxuriant gardens, a piano-bar, a Spa, Boutiques and superb reception areas. The Souks of Marrakesh are certainly the most colourful and the most lively in Africa. The different trades are grouped by services they offer: the Dyers, the Blacksmiths, the Babouche and Shoe-makers, Spice and Fabric sellers. Your journey ends at the renowned Djemaa El Fna square, a popular entertainment area where at the end of the afternoon, storytellers, snake-charmers, tooth-drawers and dancers appear to entertain the crowd in a scene that is pure street theatre. Guests will meet on a roof terrace overlooking the Square for soft drinks prior to returning back to the hotel to change for dinner. At the entrance, proceed through a spacious corridor which is lit by lanterns and high candelabras and leads to a beautiful fountain with roses whose heady perfume blends with the pleasant smells of amber and musk. 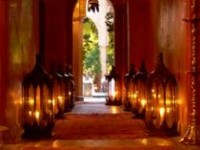 The corridor runs into a beautiful Riad  a tinsel water mirror covered with rose petals and a reflection of the flickering candlelight and the majestic façade of bricks and earth. Gourmet Moroccan dinner with waiting staff traditionally dressed, Gnaouas singers and dancers - descendants of slaves traded from Guinea , their music reflects both Arabic and African influence and live Arabo-Andalusian music as entertainment. A wall fountain, paved with Zellij extends the pool surrounded by lush vegetation. On both sides of the courtyard, an arcade allows the access to the glass Moroccan lounges. A spiral staircase opens on to the lounges upstairs and leads to a ravishing roof terrace converted into a luxurious outdoor oriental lounge, with a fantastic panorama on the Medina. In this harmonious and serene setting a refined luxury is combined with an opulent comfort; soft colours, walls with antique mirrors, sumptuous velvets of curtains and comfortable low divans, zellij with impressive motifs, ancient ceilings, silver and bronze candelabras, traditional furniture and carpets. Pre-dinner alcoholic house fruit cocktail, 4-course gourmet Moroccan menu, limitless Moroccan wine & soft drinks during the meal are all included. You will depart for an adventure safari trip across the foothills of the majestic High Atlas Mountains featuring impressive landscapes and picturesque Berber adobe villages. Explore the high Atlas mountain region and the Valley of Ouirgane , also known as a " Happy Valley " thanks to its natural beauty and amazing landscapes. Witness a kaleidoscope of colour as we travel through the spectacular countryside. This fun and informal day in chauffeur-driven jeeps, will give you the opportunity to see some stunning scenery and Moroccan life at its most simple, away from the hustle and bustle of the city. There will be ample opportunity to take photographs and also stops along the route for refreshments. We cross close to the small Berber villages with their country schools, and will pause to give sweets and coloured pens to the delight of the local children. The journey continues through the Berber village of Asni, situated in the high Atlas mountains at the foot of the Djebel Toubkal, the highest peak of North Africa at 13,670ft. The rally will continue to the picturesque village of Ouirgane where this excursion will conclude with a wonderful barbecue lunch at the renowned "La Roseraie", an exquisite property set amidst a spectacular rose garden. Following lunch continue on a circuitous road back to the hotel and Marrakesh. This is a complex of bar, restaurant and dance space. Take in the outrageous surroundings of this contemporary oriental fantasy. 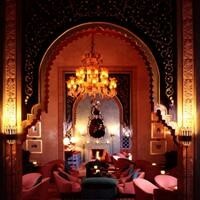 This is truly a trendy and hot addition to Marrakesh nightlife. Entertainment comprises of DJs, background music, tray dancers and belly dancers. Enjoy a hot air Balloon flight with dramatic aerial views of the bumpy vast Marrakesh Palm Grove and the surrounding countryside. There will be a early morning departure from the hotel. In each jeep, there will be a cool-box with soft refreshments, a flask of coffee, Moroccan pastries, a basket of fresh & dried fruit, and more. Savour the benefits of the traditional Moroccan relaxing Hammam (steam bath), including a complete scrubbing and traditional massage. This option includes also a wicker basket containing local products as well as return transfers.